SINGIN’ IN THE SWEATER VEST. 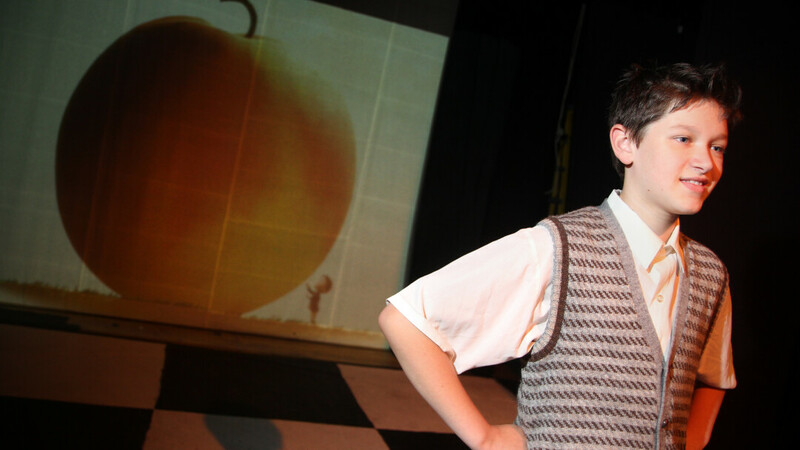 Max Sperry stars as James in James and the Giant Peach. Roald Dahl is known for his beloved, imaginative stories, and his 1961 children’s book, James and the Giant Peach, is no different. Now, the Chippewa Valley Theatre Guild will bring this wondrous story to life on the stage of the Grand Theatre in September. James and the Giant Peach is the magical tale of James, a young orphan boy who uses a giant peach to escape his two mean aunts. After James is orphaned, he is sent to live with his Aunts Spiker and Sponge. Then, one day James is given a box of magical, glowing critters by a strange old man that cause the peach on his aunts’ tree to grow and grow. Soon, the peach is big enough that James tunnels into the peach and makes friends with the life-size bugs (Grasshopper, Centipede, Earthworm, Miss Spider, and Ladybug) that live in the peach. All of them dream of a better home than this one, so the Centipede attempts to saw the stem of the peach in half. The peach snaps off the tree and starts rolling toward the Atlantic Ocean, while James is still inside of it! The peach rolls off a cliff and drops into the water where it, and James, float away. Their goal is to get to New York City, but traveling in a giant peach poses a lot problems. Directed by Nikki Hoeppner, James and the Giant Peach features a cast of 25 and stars Max Sperry as James. His bug friends are played by Ava Balciunas (Ladybug), Trevor Barribeau (Grasshopper), CeCe Mekraz (Earthworm), Sergio Sigala (Centipede), and Alissa Vanderbark (Miss Spider). The show also features Angela LaVoy and Tammy VanBlarcom as James’ Aunts Spiker and Sponge, respectively, as well as a large chorus of many others.